English: The French State in 1942. This vector image includes elements that have been taken or adapted from this: Europe 1942.svg (by Alphathon). A map of Europe circa 1942, at the height of Nazi expansion. 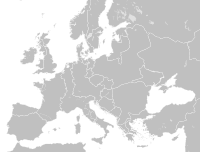 Based upon https://commons.wikimedia.org/wiki/File:Blank_map_of_Europe.svg the details of which follow. Contributors. 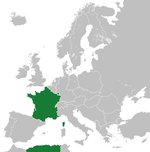 Original Image: (http://commons.wikimedia.org/wiki/Image:Europe_countries.svg) Júlio Reis (http://commons.wikimedia.org/wiki/User:Tintazul). Recolouring and tagging with country codes: Marian "maix" Sigler (http://commons.wikimedia.org/wiki/User:Maix) Improved geographical features: http://commons.wikimedia.org/wiki/User:W!B: Updated to reflect dissolution of Serbia & Montenegro: http://commons.wikimedia.org/wiki/User:Zirland Updated to include British Crown Dependencies as seperate entities and regroup them as "British Islands", with some simplifications to the XML and CSS: James Hardy (http://commons.wikimedia.org/wiki/User:MrWeeble) Validated (http://commons.wikimedia.org/wiki/User:CarolSpears) Changed the country code of Serbia to RS per http://en.wikipedia.org/wiki/Serbian_country_codes and the file http://www.iso.org/iso/iso3166_en_code_lists.txt (http://commons.wikimedia.org/wiki/User:TimothyBourke) Uploaded on behalf of User:Checkit, direct complaints to him plox: 'Moved countries out of the "outlines" group, removed "outlines" style class, remove separate style information for Russia' (http://commons.wikimedia.org/wiki/User:Collard) Updated various coastlines and boarders and added various islands not previously shown (details follow). Added Kosovo and Northern Cyprus as disputed territories. Moved major lakes to their own object and added more. 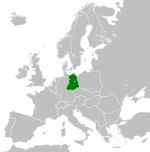 List of updated boarders/coastlines: British Isles (+ added Isle of Wight, Skye, various smaller islands), the Netherlands, Germany, Czech Republic, Denmark, Sweden, Finland, Poland, Kaliningrad Oblast of the Russian Federation (and minor tweaks to Lithuania), Ukraine, Moldova (minor), Romania, Bulgaria, Turkey, Greece, F.Y.R. 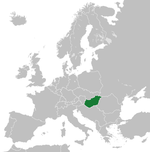 Macedonia, Serbia, Bosnia and Herzegovina, Montenegro, Albania, Croatia, Italy (mainland and Sicily), Malta (http://commons.wikimedia.org/wiki/User:Alphathon). This page was last edited on 5 August 2018, at 20:39.